Atrial septal defect (ASD) is a heart defect that is present at birth (congenital). As a baby develops in the womb, a wall (septum) forms that divides the upper chamber into a left and right atrium. When this wall does not form correctly, it can result in a defect that remains after birth. This is called an atrial septal defect, or ASD. Normally, blood cannot flow between the two upper heart chambers. However, an ASD allows this to happen. When blood flows between the two heart chambers. This is called a shunt. Blood most often flows from the left to the right side. When this happens the right side of the heart enlarges. Over time pressure in the lungs may build up. When this happens, the blood flowing through the defect will then go from right to left. If this occurs, there will be less oxygen in the blood that goes to the body. Atrial septal defects are defined as primum or secundum. The primum defects are linked to other heart defects of the ventricular septum and mitral valve. Mitral stenosis is a disorder in which the mitral valve does not fully open. This restricts the flow of blood. Secundum defects can be a single, small or large hole. They may also be more than one small hole in the septum or wall between the two chambers. Very small defects of (less than 5 millimeters or ¼ inch) are less likely to cause problems. Smaller defects are often discovered much later in life than larger ones. Along with the size of the ASD, where the defect is located plays a role on blood flow and oxygen levels. The presence of other heart defects is also important. ASD is not very common. A person with no other heart defect, or a small defect (less than 5 millimeters) may not have any symptoms, or symptoms may not occur until middle age or later. The health care provider will check how large and severe an ASD is based on the symptoms, physical exam, and the results of heart tests. The provider may hear abnormal heart sounds when listening to the chest with a stethoscope. A murmur may be heard only in certain body positions. Sometimes, a murmur may not be heard at all. A murmur means that blood is not flowing through the heart smoothly. The physical exam may also show signs of heart failure in some adults. An echocardiogram is a test that uses sound waves to create a moving picture of the heart. It is often the first test done. A Doppler study done at the same time as an echocardiogram allows the health care provider to assess the amount of shunting of blood between the heart chambers. ASD may not need treatment if there are few or no symptoms, or if the defect is small and is not associated with other abnormalities. Surgery to close the defect is recommended if the defect causes a large amount of shunting, the heart is swollen, or symptoms occur. A procedure has been developed to close the defect without surgery. The procedure involves placing an ASD closure device into the heart through tubes called catheters. The health care provider makes a tiny cut in the groin, then inserts the catheters into a blood vessel and up into the heart. The closure device is then placed across the ASD and the defect is closed. Sometimes, open-heart surgery may be needed to repair the defect. The type of surgery is more likely needed when other heart defects are present. Some people with atrial septal defects may be able to have this procedure, depending on the size and location of the defect. People who have surgery for ASD should get antibiotics before any dental procedures they have in the period following the procedure. Antibiotics are not needed later on. In infants, small ASDs (less than 5 mm) will often not cause problems, or will close without treatment. Larger ASDs (8 to 10 mm), often do not close and may need a procedure. Important factors include the size of the defect, the amount of extra blood flowing through the opening, the size of the right side of the heart, and whether the person has any symptoms. Some people with ASD may have other congenital heart conditions. These may include a leaky valve or a hole in another area of the heart. Call your health care provider if you have symptoms of an atrial septal defect. There is no known way to prevent the defect. Some of the complications can be prevented with early detection. 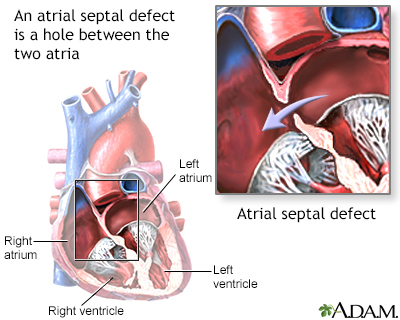 An atrial septal defect is a congenital heart defect where the wall between the right and left atria does not close properly, leaving a hole between the two atria.